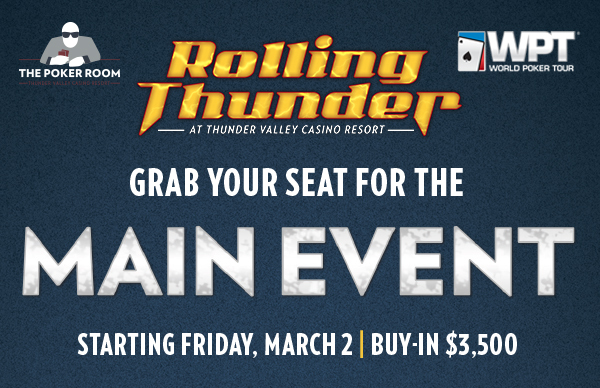 Win a @WPT Rolling Thunder $3,500 Main Event seat in one of tonight's two satellites. There's a 15-seat-guarantee on the 6pm $400 buy-in 1-in-10 satellite - 15,000 stacks and 20-minute levels. At 8:30pm, there's a $400 turbo satellite with 3 more seats guaranteed - 15,000 stacks and 15-min levels. Registration and the unlimited re-entry period for each satellite is open until the start of Level 7. 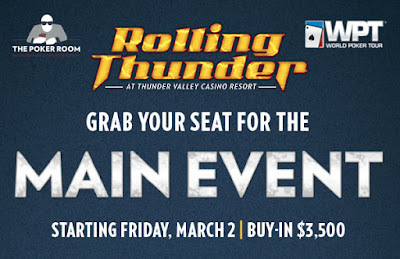 But that's not all ... there's 5 MORE seats guaranteed in Saturday's $400 TURBO satellite as well, so make that 23 more seats - at least - to be awarded. Day 1B starts at noon Saturday.